Periodic Table ebook for Apple iPad – visually stunning. You may think that I’m an Apple Fanboy with the amount of Apple related stuffs going on within these pages. Well I guess I am. With that vid of the ebook, quite a visually compelling reason, imho, to ditch Kindles over iPads. And with that, who’s to say electronic inks on the kindle will rule the ebooks world? Not that I’ll get myself an iPad anyway. Cats are Man’s best friends and how to work smart. When work’s just plain crazy, guess what’s the best thing to do when there’s simply too much to do for the day? Yep, you stop working and go home to rest, and then continue tomorrow — what, you weren’t expecting an answer like “continue working and burn the midnight oil” did you? No, I’m not advocating running away but rather a smarter way to solve or finish them. When one’s tired, mentally and physically, any work that’s done in such a state is just sloppy and more accurate than David Ngog’s scoring touch, the unintended mistakes will start accumulating. It’s true, a tired mind simply isn’t as alert and reactive as a fresh, eager mind so next time that you have too much to do, take a break have a kit kat and just go take a rest, as much as you have to, and continue back when you’re done. I’ll personally vouch for this advice I’m giving (or otherwise I shouldn’t be giving advices right???) and myself, I’ve felt the ‘resurrection’ everytime I take a power nap, a short but purposeful nap to give yourself a quick energy boost. If you’ve heard of polyphasic sleep, well no this is not it. I remember back during my Primary School days, whenever there was extra classes in the afternoon, our teacher would make us sleep, close our eyes and be devoid of any activity, and simply rest, before beginning her afternoon lessons. When it’s time to wake up, everyone would moan, but minutes after that, almost none would feel sleepy and tired during lesson and in my case, I’ve to thank her, my teacher, Mrs chia, for introducing me to power naps. Even in my Secondary School, we took power naps after lunch. It sure helps us to focus greatly later on, now that’s studying smart. Working smart is no different either — take a break if you think you need one, and who cares if the job’s on hold, as long as you’re able to meet its deadline right? Take a rest if you think you’re going to have to go on for a long time. And *drum rolls* take a good sleep if there’s just too much wor for you to complete tonight. Continue tomorrow, and work smart. Work never really ends or gets finished anyway, so do your body a favour and work smart. Then sometimes, when you’re tired from slugging it out at work, when your bike’s at the workshop cos the engine failed on you that morning, and when the taxi ride home made its claim for a pole position in the Singapore GP, you’ll realise just how lovingly cats are, as they greet you at the door, sleepy eyed and yawning at the same time brushing against your legs and purring away. Awwww, I’m so lucky to have these 2 cats welcome me home when everyone else in the family are snoring away. But why do I have a hunch that my cats are nudging me for a quick treat and a back rub at 1.30am in the morning? 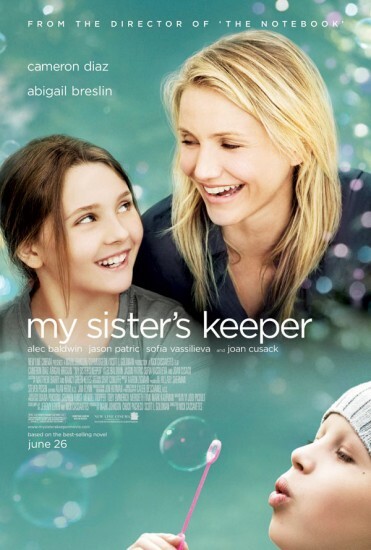 My Sister’s Keeper, movie review. Not bad, really not bad. I’ve watched a couple of movies lately, Clash of The Oh-It’s-So-Good Titans, It’s Complicated, The Men Who Stare At Goats, The Green Zone, and rewatched My Sister’s Keeper again. These are all really good movies, entertaining in their own rights, and never quite disappointing, but the latter has never failed to move me with every repeat viewings. No I don’t get that same level of experience like when I’m taking on Avatar, but the nostalgic flashbacks that I get of my own first hand experience of living with someone who’s terminally ill, well that’s how My Sister’s Keeper keeps me glued. Watching the girls’ battle against their mum’s will, seeing how the older brother gets mildly alienated in the process, and how the father keeps up the strong front of trying to keep the family strings together, well in very simple words, it’s all admirable and reinforcefull. Nevermind that I didn’t quite like Cameron Diaz playing the Mother role and couldn’t really evoke as much eagerness, sadness and force as, say a certain Renee Zellweger or Sandra Bullock, but she did not bad on the whole. Overall the movie moves back and forth in time and narration of the various leading character leads the shifts and tells you a story of love and release and how a Mother’s love can be strangling, despite all the care and concern — because sometimes, you need to learn how to let go. In short, My Sister Keeper is a show of how Mother comes to accept her child’s passing, only during her dying moments, not without a purposefully court scenes just to show her so. The thing about this movie is that I loved the strengths and weakness of each characters, and particular the understanding and accomodating nature of the Father’s character. Comparing from an Asian context, I wonder how many Asian fathers would react like how Jason Patric did. It’s simply and admirably charming. So go ahead, if you’ve yet to watch a sappy lovely drama of family strengths and acceptance, go give My Sister’s Keeper a chance and who knows, maybe you’ll find your own strengths and weakness and learn to embrace them as well. Now that’s not a bad thing right? Buzz buzz buzz buzz buzz have you heard? Changi Motorsports Hub (CMH) bid lost by Singapore Agro Agriculture and Sports Services. Battlestar Galactica ride closed due to technical glitch. Hand Food And Mouth Disease On The Rise – Remember To Wash! PS: I’m still looking for co-bloggers for Temasek Musings, holler if you’re interested. Come join me and bring some light-hearted heavy news. Gmail’s vowel outage, outrageous tech frisson!!! It deos hlod ture taht one is albe to ctontniue rdeanig a pssaage of txet no mttaer how it’s seplt as lnog as the frsit wrod and lsat wodrs are in pacle. BUT fortunately, Google didn’t pull a similar prank as mine above, in juxtaposing the letters in words, BUT unfortunately they pulled, pun intended, a joke (that’s what I think it is) where vowels where stolen. I waited almost whole day to see what prank the Google team were gonna come up with after previous years’ frissons. Apart from this year’s Google changing to Topeka, I think.. THE VOWELS WERE STOLEN! How gutsy right? Used by millions of users worldwide, excluding China (heh), and they have the cheeks to pull this off — and that’s why I’ve always admired the geeks, I mean guys at Google. A company with such high profile stocks and plenty of reputation at stake, well with this latest stunt, what’s a reputation worth if you’re not having fun at the same time right? In fact, isn’t it nice that they’re having fun in these times? Much like how the culture is at 2Advanced.com, my idol website geeks, I mean guys, Google’s unrestrained working environment meant that people could be proven to be productive and fun at the same time (are you listening Bosses?). Take off your shoes, make paper balls and throw them around, wreak havoc, sing song, be crazy, but work when you have to, and not just doing the job right, aim instead to do the right jobs. It’s somewhat similar to what’s being cultivated over at my workplace, where we do have plenty of fun working with each other, and productivity levels have never been higher. When one person cracks a joke, or makes fun, it eases the work tension and gets everyone tighter and fills any tireness with endurance. And especially when the boss joins in, the rapport built makes everyone want to work harder, longer and achieve more. Of course there are days when we’re just overworked and that’s when everyone knows that it’s time to slow it down, kick back and just take things lightly. So, if you’re a Boss, and you’re reading this, lighten up on the authority, especially if you’re wondering why the human resource turnover exceeds that of your stapler inventories. Take a lesson from Google, and see what a fun working environment can bring to your productivity levels. Of course, I hope that the bosses and guys over at a power station or nucelar plant don’t start loosening and taking things lightly in their departmentes — because some things just need to stay tight.